In anticipation of the development of the site the temporary closure will be subject to the outcome of remediation works as part of the preliminary operations. Therefore for safety reasons, there will be no access to the site nor the museum during this period and until further notice. We look forward to reopening upon completion of the project. The Ferrari F40 is a mid-engine, rear-wheel drive, two-door coupé sports car built from 1987 to 1992. Produced as the world’s fastest production car, the story of the Jaguar XJ220 is one of power, status and international finances, both under and above the hood. Developed by David Brabham with Thomas Walkinshaw Racing to test endurance of carbon and plastic bodywork on a high performance vehicle, it ended up being the world’s first fully carbon fibre road car. Mercedes-Benz introduced a Roadster version of the 300SL at the 1957 Geneva Motor Show. It effectively replaced the gullwing coupe which was retired that year. The most advanced sports car design of the 1950’s and was the first post-war supercar with a price-tag to match. If for nothing else the Porsche 550 Spyder will be remembered as the car James Dean was driving when he had his fatal crash. 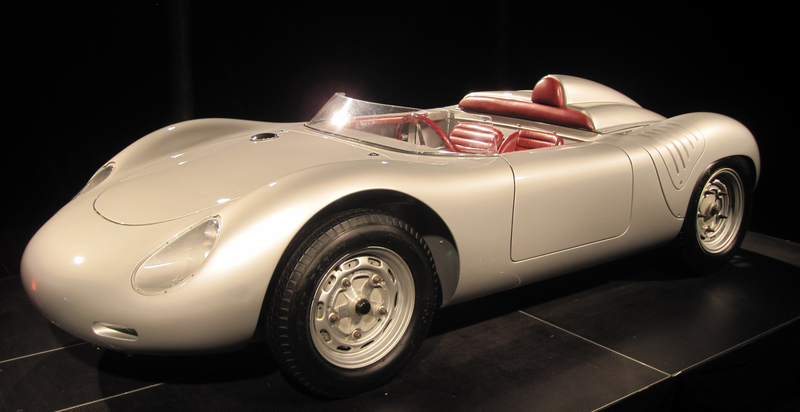 The RSK was a development of the successful Porsche 550A with improvements being made to the body work and suspension. One of only 502 made, the Mercedes Benz 190E Evolution II boasts a radical body kit designed by Prof. Richard Eppler from the University of Stuttgart and has a Cosworth component engine. An ultra high-performance, mid-engine, two seat sports car with an aluminium space frame chassis, aluminium body panels and a contemporary interior. With only 272 vehicles produced the Ferrari 288GTO is a true collectors’ car. It boasts a top speed of 304kph and in just 4.9 seconds it will see you go from 0-100kph! It’s red or nothing for this true beauty, having only been produced in the classic Rosso Corsi Red. As if that’s not enough to grab your attention, the Ferrari 288 GTO is the first Ferrari road car to use a turbo charged engine. The Ferrari 288 GTO has for too long been overshadowed by its later more iconic trio of the F40, F50 and Enzo Ferrari successors. However, none of these iconic vehicles would ever have made it into production if not for the work of the this striking car, named the number two by Sports Car International on their list of Top Sports Cars of the 1980s ranking second to only the Porsche 959. So before you rush to take a look at some of the more famous red beauties (also on display at the Fox Classic Car Collection by the way) stop for a moment and admire the Ferrari 288 GTO. You shouldn’t need to be told twice, but just in case, here are three great reasons to do so. It’s rare! With only 272 vehicles produced this is a true collectors’ car. Originally designed for the race track, 200 cars were required, but fate intervened in the cancelation of the Group B racing series and all built remained purely road cars. This particular vehicle on display is believed to be number 116 off the production line. It’s fast and stylish! While not boasting quite the accelerating powers of its successors, they had the advantage of learning from the 288 GTO. It still boasts a top speed of 304 k/ph and you wouldn’t sneeze at going from 0-100 in just 4.9 seconds, scream yes, but sneeze, definitely not. While later Ferrari’s feature increasing adventurous design, there is a certain style in the 288 GTO form and functionality. It’s ground-breaking! The 288 designation derives from its 2.8 litre V8 engine, which is supported by electronic fuel injection and ignition. Unlike the earlier 308, the engine is rotated longitudinally into the space formally assigned as the trunk. Produced as the world’s fastest production car, the story of the Jaguar XJ220 is one of power, status and international finances, both under and above the hood. With only 350 vehicles produced of an initial order of 1400 and only 6 making it to Australia, there are few opportunities to see such a vehicle. With an original price tag of $960,165, this car definitely ticks the super-price category of the super-car. This high price ensured that the majority of XJR-15’s entered private collections and were never driven. This particular XJR-15 is one such example. Not to be confused with the Evo I, this model is the new and improved version with standard features such as the AMG PowerPack (hotter camshafts, a larger diameter throttle body, more aggressive ignition and fuel management as well as optimization of the intake and exhaust systems). Like the Gullwing, the Roadster featured roughly the same engineering underneath, but the body was changed to incorporate regular doors. Detail differences included larger front fenders, larger ‘euro’ headlights, a smaller grille, a rounder front windscreen and a chrome accent strip running down the side of the car. Unveiled at the 1954 New York Car Show as a two-seat, closed sports car, it was immediate in its impact with an unmistakable appearance. After the austre post war years it boasted the most advanced sports car design of the 1950’s and was the first post-war supercar with a price-tag to match. There is much more to this fascinating machine than this tragic accident. Introduced at the 1953 Paris Motor Show it was given the in hindsight unfortunate nickname of “The Giant Killer” in reference to its ability to compete with the powerhouses of Ferrari and Jaguar. The Porsche 718 is a racing car built by Porsche between 1957 and 1962. The car is a RennSport build with a wheelbase shorter (German 'Kurz') than typical of predecessors of the era and this led to the car being referred to as the RSK. It had a mid-engined layout and used the 142 horsepower (106 kW) 1.5-litre Type 547/3 quad-cam engine introduced in the 550A. From the moment the first of these custom-built cars were delivered in late 2004, the Ford GT set the supercar world on its ear with its supercharged 550 horsepower V-8, 205-mph top speed and exotic styling inspired by the historic Ford GT-40 race cars. An ultra high-performance, mid-engine, two seat sports car with an aluminium space frame chassis, aluminium body panels and a contemporary interior, the Ford GT showcased the engineering prowess of the Ford Special Vehicle Team and will forever stand as among the most memorable cars ever produced in Ford’s 100-plus year history. 3.55 in. x 4.17 in. The Collection consists of cars representing key stages of automotive excellence. Each car has a rich history and link to a dramatic increase in technology and design. The Fox Car Collection is constantly changing, cars are rotated so that maintenance, cleaning and testing can be done without too much interruption. The vehicles listed below are currently on display. They are drawn from the museum's vehicle register and private owner special agreement contract. Join our community and receive the latest news on what's new and what's coming up! The collection is guaranteed to capture everybody’s imagination, with prominent examples of Bentley, Ferrari, Jaguar, Porsche, Rolls Royce and one of the largest Mercedes-Benz car collections in the southern hemisphere. The collection has them all with vehicles steeped in history, one off prototypes and cars that dreams are made of. We have a fantastic group of volunteers who operate the Open Day program for visitors at the Fox Classic Car Collection museum. Many of the volunteers have an amazing knowledge of vehicles or are themselves restorers of fine vehicles. They love to chat and are such nice people that they too are a highlight of the museum experience. The door takings from the Volunteer Open Day Program are donated to a range of charities. It is through the goodwill and generosity of the volunteers that such donations are possible. Please contact us if you are interested in becoming one of our volunteers. "We wish to extend our sincere thanks to the volunteers of Fox Classic Car Collection for the generous donation of $10,000 to The Smith Family in Victoria. The proceeds of your museum tours will make a real difference to children in need. At The Smith Family, we believe supporting a child’s education is the best way to help break the cycle of disadvantage. One in seven Australian children and young people are living in poverty and need support from The Smith Family to make the most of their education. Your generous contribution will support Learning for Life, The Smith Family’s educational support program, which this year reached 33,195 students who live in need, nationally and 7,376 students in Victoria. The Learning for Life program recognises that disadvantaged children need extra support to stay at school and go on to further studies or a job. Thanks again for your outstanding contribution and we look forward to working with you again in the future." Thank you for forwarding the generous gift. Berry Street is combining three trauma-informed, evidence based projects which we believe will help prevent the cycle of violence, disadvantage and abuse recurring in both current and future generations. Our vision is to raise $2.4 million over three years…. Fox Classic Car Collection’s contribution will help us reach our ambitious goal. Our men’s shed would be the only service of its kind for men residing in the southern area of the Hume municipality. There are a number of older men in the community who are facing issues associated with significant change, including ageing, health, retirement, isolation, unemployment, disability and separation. Your financial support will assist us to address these issues and facilitate our ability to continue work in our community. Brought up in the Melbourne suburb of Prahran in a working class family Lindsay Edward Fox AC (born 19 April 1937) is one of Australia’s best known businessmen. He is the founder and chairman of his family-owned trucking and logistics company, Linfox. He started working as a truck driver after leaving Melbourne High School at an early age and now employs about 18,000 people throughout Australia, New Zealand and Asia. He is renowned for his tremendous work ethic, raw business savvy and philanthropic generosity. Lindsay Fox is on the board of the National Advisory Council on Suicide Prevention. In 1992 he was named 'Victorian Father of the Year'. He was appointed an Officer of the Order of Australia in the Australia Day Honours of 1992, in recognition of service to the transport industry and to the community. In 2001, he was awarded the Centenary Medal. In the Australia Day Honours of 2008, he was advanced to Companion of the Order of Australia (AC), in recognition of his continued service to the transport and logistics industries, to business through the development and promotion of youth traineeships, and to the community through a range of philanthropic endeavours. Lindsay Fox played Australian rules football with the St Kilda Football Club's thirds side (which he captained). He became the president of the Saints in 1979. He has a passion for classic vehicles and has been collecting vehicles for many years. He has donated many vehicles to a Trust and these are on display for the public to view and enjoy, located in the Queen’s Warehouse in the Melbourne Docklands precinct. The collection is renown both within Australia and overseas.